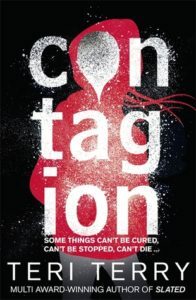 Contagion by Teri Terry is a ticking time bomb of a novel, each chapter bringing the reader closer to the point of impact. This pre-apocalyptic dystopian novel set in Scotland follows two unique and compelling viewpoints; Shay, whose world is about to be changed forever, and Callie, who has seen everything but can communicate nothing. Both characters have secrets and limitations that they must keep from each other, creating that sense of urgent frustration that means you’re reading something great. The chapters in the first part of the book begin with a countdown, which is easy to ignore at first but slowly because crucial to the plot, leaving you flicking through the pages to find out what happens when that timer reaches zero. Contagion is exhilarating; throughout the novel’s fast pace, Terry drops foreshadowing and hints like a trail of breadcrumbs. The world-building is spectacular; Terry has put a lot of research into making the fictional epidemic seem plausible, and it shows. For as much as my limited knowledge of quantum physics is worth, I couldn’t find any plot holes or anything that lowered the believability of the story. The main characters are written so that they feel their ages; Callie is impatient and impulsive and a little bit selfish, but it feels justified and natural for a thirteen year old girl. Shay is more mature and thoughtful, but still headstrong as a teenager should be. Terry doesn’t shy away from the impact that an unpredictable epidemic would have on adolescents, and conveys their suffering and fear in beautifully tragic detail. The action scenes and brief periods of rest are laced with tear-jerking moments that surprise you by showing just how attached to these characters you really are. Contagion is an outstanding beginning to a series that I’m already holding out to read the rest of. Terry’s writing hooks you from the very first page, never letting go of the suspense. It’s the kind of book that you either read all in one go, or every second you’re not reading it, you’re thinking about reading it. What a thrilling read! Contagion will be released on May 18 2017. Posted in Book Review and tagged book review, thriller, young adult.